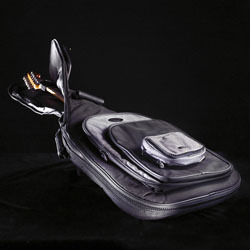 The CNB brand is known for its range of high quality instrument gig bags. CNB gig bags are well made, from good quality materials and the thick padding throughout offers a high level of protection for your instrument. Carrying your guitar is also made more comfortable by padded shoulder straps. Each CNB gig bag has heavy duty zippers, good size accessory pockets and a neck support strap to keep the guitar safe when the bag is opened in an upright position. The CNB gig bag range also includes models for acoustic jumbo, Flying V and Firebird and acoustic bass. Ask for CNB at your local music retailer.